This beautiful Chinese paper cuts features the twelve signs of the Chinese zodiac. Chinese Zodiac symbol - Tiger is on the center of this paper cuts. 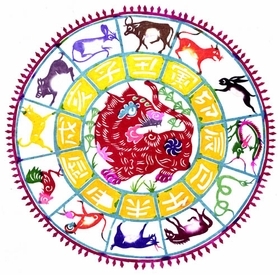 Chinese Zodiac: twelve animals corresponding to the Twelve Terrestrial Branches - rat, ox, tiger, rabbit, dragon, snake, horse, goat, monkey, rooster, dog and boar.